NETWORK UPDATE: FOX’s UFC FIGHT NIGHT climbed 0.2 in final numbers to 1.1. However, the premiere of BOSTON EMS and the reruns of BATTLEBOTS and NCIS: LA each lost 0.1. 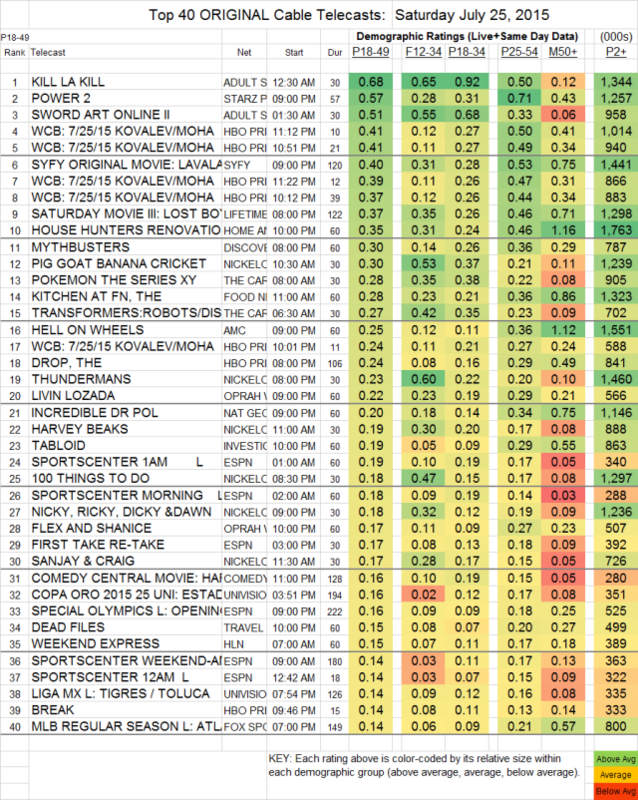 CABLE HIGHLIGHTS: The top Saturday cable “original” actually doesn’t appear on the chart because technically it was a rerun, but as we’ve been reminded by fans, DRAGON BALL Z had previously aired in an edited version. The Adult Swim airing on Saturday was at 0.73 in 18-49s, with 1.54M total viewers. That put it ahead of KILL LA KILL, up 0.17 from last week to 0.68, and SWORD ART ONLINE, up 0.11 to 0.51. Starz’s POWER was up 0.04 to 0.57. HBO reports its boxing ratings in segments, and Saturday’s edition was 0.41-0.24. Both Syfy and Lifetime had original movies in the Top 10: the former’s LAVALANTULA at 0.40, and the latter’s LOST BOY at 0.37. HOUSE HUNTERS RENOVATION (HGTY) was down 0.07 to 0.35. MYTHBUSTERS (Discovery) dropped 0.03 to 0.30. AMC’s HELL ON WHEELS had a serious 0.13 drop to 0.25. On BBCAmerica, the finale of JONATHAN STRANGE AND MR. NORELL was up 0.01 in 18-49s to 0.05, but down 40K total viewers to 187K, while ATLANTIS stayed at 0.02 in the demo but gained 32K total viewers to 117K. BIG BROTHER AFTER DARK (POP) was at 0.03/126K.